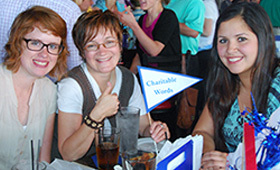 Since 2012, more than 70 Charitable Words Scholars have been engaged with internships. special assignments and scholarships. Many continue to be engaged in networking, mentoring, community service and available for special assignments and freelance work. Pictured: University of Cincinnati Scholars Sarah Jernigan and Tia Garcia and advisor Elissa Yancey at a Literacy Network spelling bee benefit. Miami University Scripps Gerontology Center: Eleni Balli, Kellyn Czajkowski, Jessica Littrell, Kaitlin Moore, Alexandria Predota, Josie Rader. Northern Kentucky University: Lyndsey Rudd, Kari Huffman, Taylor Harris, Rachel Kellerman, Sydney Martin, Erin Mullins, Holland Rains, Thaddeus Walls, Clara Fightmaster, Kelly Klein. Also, 13 students in Professor Julie Olderding’s Nonprofit Management Certificate Program selected Charitable Words as its case for support project Spring term 2015. Ohio State University: Sallee Ann Ruibal. Cincinnati State College: Andrea Baker, Rachel Bonor, Kat Collinsworth, Ashely Gray, Kristen Heithaus, Jordan Klosterman, Sara Layne, Tyler Mechlem. College of St. Benedict: Scholarships available in the school of nursing for person-centered care studies and programs. Special assignments: Mathilde Archibald, Julia Gat, Bérangère Pont, Héloïse Arnault, Bachir Nuor, Steven Vandeporta: Manuel Rivera-Ortiz Foundation for Documentary Photography and Film. Service learning: Katelyn Berry, David Funk, Mark Goodly, Cincinnati Public Schools.